You want to leave Snapchat behind. That’s easy, and we can help. Go down the list, and there are various reasons why you’d want get Snapchat out of your life. The service may have gotten too addicting. Perhaps you’re trying to escape the risqué nature of it. Data collection, too, might be concerning. Snapchat also lost its mojo against Instagram anyway, and a large number of users are embracing the Facebook-owned service these days. Whatever your reason to ditch Snapchat, we’re not here to judge. It takes only a few steps to cleanse yourself of Snapchat and the obsessive, sometimes scandalous attraction. Now you’re all set following the 30-day grace period’s expiration. 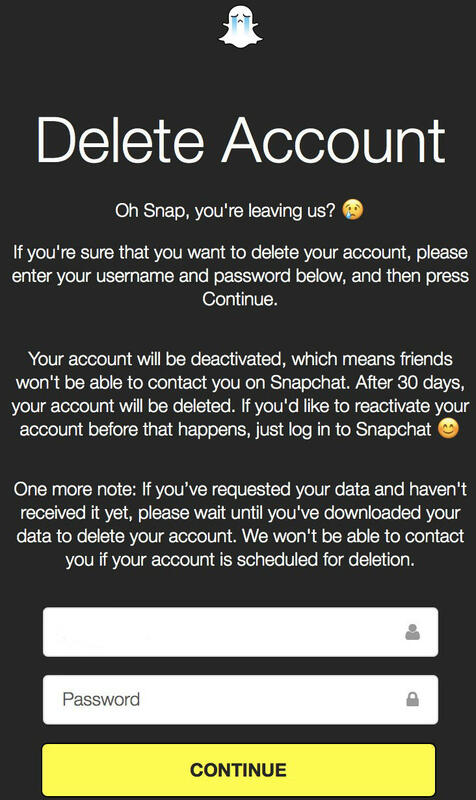 Snap will have your account deleted and never seen again. All the data with it will be gone, too. But, if you ever want to return, you can do so by making a new Snapchat account. The only annoyance is re-adding all those contacts. Snapchat may not be as hot as before, but your friends and family are definitely still on it. Don’t be surprised if you reinstall Snpchat after some weeks or months away. Regardless, leaving Snapchat behind for any amount of time could feel so refreshing.